This high-tech looking assembly is capable of some truly fantastic feats. The new iPad accessory is called the Structure Sensor, and it will add a whole new layer to your world. As the first 3D sensor for mobile devices, the Structure Sensor does what was impossible just a few years ago: it performs complex 3D operations without the need for a powerful desktop computer. Structure slips onto your iPad over the built-in camera, adding 3D sensors and IR lasers to the iPad’s existing functions. You can then use your iPad to capture the world in three digital dimensions. The gadget comes with a few apps that demonstrate its remarkable abilities. 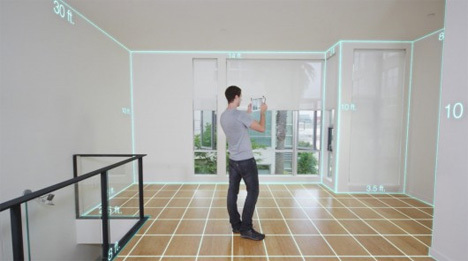 One can be used to capture an entire room, complete with measurements, allowing you to plan for remodeling or furniture rearranging. Another app lets a digital pet interact with your physical environment as you view the scene through your iPad. The Structure Sensor also does something that no other augmented reality invention has been able to do: it enables games in which digital objects can actually go behind real world objects on the screen. Occipital, the company behind the Structure Sensor, emphasizes that their gadget is really about creating a platform for developers to use in making their own awesome apps. Not surprisingly, the Kickstarter campaign to fund the gadget smashed through its goal many times over. Personally, we can’t wait to start playing fetch with that virtual pet.